1) Upon his retirement from the Michigan Supreme Court, Joseph Tar Copeland, built a home on the campus grounds of the Michigan Military Academy, currently the site of Orchard Lake St. Mary’s. This impressive oak and brick home had the architectural lines of a mid-Victorian castle. At the onset of the Civil War, Copeland was called out of retirement and fought with the 1st Michigan Cavalry. A few years after the war ended, Lt. Col. Copeland, with the help of a few investors, added on to his home, creating the Orchard Lake Hotel. The hotel opened on June 20, 1872, accommodating about one hundred guests. (It closed in 1877, never having recovered from the financial panic of 1873.) In 1871 J. Henry Whittemore composed Orchard Lake Polka, “Dedicated to the Stockholders and Patrons of the Orchard Lake Hotel, the Saratoga of Michigan.” The cover features a picture of the hotel and Orchard Lake. 2) In 1899, Orchard Lake Cadets March was published. The piece was dedicated to the Michigan Military Academy. Its composer, Richard W. Groom, served as music director at the MMA from 1899-1908. 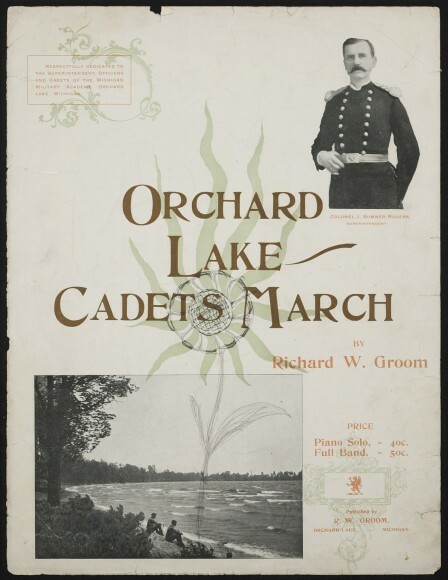 The Grand Rapids Press called it “a composition of real merit – one that exactly hits the nail of popular taste on the head.” Its cover features a picture of Superintendent Col. J Sumner Rogers, as well as the lake. The cost was 40 cents for the piano solo and 50 cents for the full band score.